^ Hughes, James (2004). Human Enhancement on the Agenda. 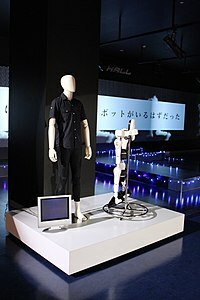 http://ieet.org/index.php/IEET/more/human_enhancement_on_the_agenda/ 2007-02-0閲覧。. ^ Enhancement Technologies Group (1998). Writings by group participants. http://www.ucl.ac.uk/~ucbtdag/bioethics/writings/index.html 2007年2月2日閲覧。. ^ a b Roco, Mihail C. and Bainbridge, William Sims, eds. (2004). Converging Technologies for Improving Human Performance. Springer. ISBN 1-4020-1254-3. ^ Agar, Nicholas (2004). Liberal Eugenics: In Defence of Human Enhancement. ISBN 1-4051-2390-7. ^ Parens, Erik (2000). Enhancing Human Traits: Ethical and Social Implications. Georgetown University Press. ISBN 0-87840-780-4. ^ Lanni C, Lenzken SC, Pascale A, et al. (March 2008). “Cognition enhancers between treating and doping the mind”. Pharmacol. Res. 57 (3): 196–213. doi:10.1016/j.phrs.2008.02.004. PMID 18353672. ^ Bailey, Ronald (2006). The Right to Human Enhancement: And also uplifting animals and the rapture of the nerds. http://www.reason.com/news/show/116489.html 2007年3月3日閲覧。. ^ Members of the President's Council on Bioethics (2003). Beyond Therapy: Biotechnology and the Pursuit of Happiness. President's Council on Bioethics. ^ a b Hughes, James (2004). Citizen Cyborg: Why Democratic Societies Must Respond to the Redesigned Human of the Future. Westview Press. ISBN 0-8133-4198-1. ^ The Royal Society & The Royal Academy of Engineering (2004). Nanoscience and nanotechnologies (Ch. 6). http://www.nanotec.org.uk/report/chapter6.pdf 2006年12月5日閲覧。. ^ European Parliament (2006). Technology Assessment on Converging Technologies. ^ European Parliament (2009). Human Enhancement. ^ Carrico, Dale (2007). Modification, Consent, and Prosthetic Self-Determination. http://ieet.org/index.php/IEET/more/carrico20070226/ 2007年4月3日閲覧。. ^ Mooney, Pat Roy (2002). Beyond Cloning: Making Well People "Better". http://www.worldwatch.org/node/521 2007年2月2日閲覧。. ^ Fukuyama, Francis (2002). Our Posthuman Future: Consequences of the Biotechnology Revolution. Farrar Straus & Giroux. ISBN 0-374-23643-7. ^ Institute on Biotechnology and the Human Future. Human "Enhancement". ^ Good, Better, Best: The Human Quest for Enhancement[リンク切れ] Summary Report of an Invitational Workshop. Convened by the Scientific Freedom, Responsibility and Law Program. American Association for the Advancement of Science. June 1–2, 2006. Author: Enita A. Williams. Edited by: Mark S. Frankel.